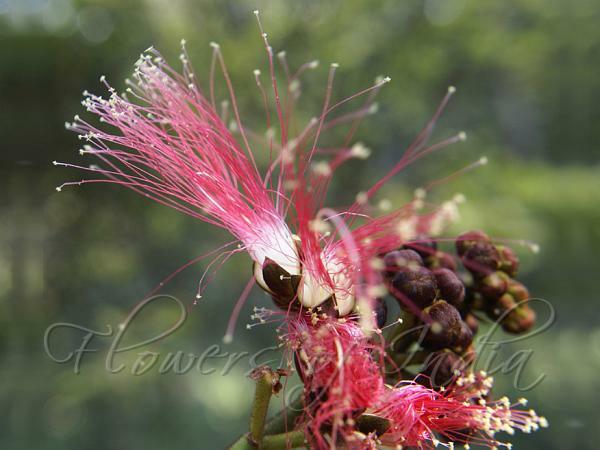 Tree Powderpuff is a large shrub or a small tree, up to 6 m tall. Parts are usually covered with hairs, except the upper surface of leaves. The plant is generally upright with few branches. Alternately arranged leaves, up to 25 cm long, are double-compound. They consist of a main shaft (called rachis) covered with reddish-brown hair-dark, from which arise 5-15 pairs of side-stalks, up to 12 cm long, on which are borne tightly, 35-63 pairs of narrow leaflets, up to 1.1 cm long, with asymmetrical bases. Flowers are borne in clusters of 3-7 stalkless or nearly stalkless flowers, at the end of branches, forming a large terminal panicle up to 30 cm long. Flowers are showy. Sepal cup is bell-shaped, with 5 teeth. Flower tube is greenish, opening into five petals, covered with reddish hairs. Stamens are united at the base, very long, up to 8 cm, dark or bright right, very colorful, the style similar to the stamens but thicker and longer. The stamens give the flowers a red appearance. The fruits are pods up to 12 cm long, narrow, straight or almost straight, reddish-brown, covered with abundant hairs. Seeds are oblong, flattened. 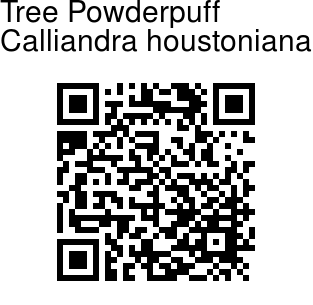 Tree Powderpuff is native to South America, grown as a garden plant in many countries including India.